The chief benefit of vinyl fences is that they are tougher and last far longer than fences built of wood or most metals. Vinyl stands up to outdoor elements like sun, rain, wind and hail better than any other material, and it doesn’t fade or warp over time. Even if you have your fence for decades, it won’t break down or age. That means that a vinyl fence offers a tremendous amount of value – once you buy it, you won’t have to replace or repair it. Regular painting or staining to keep the fence looking good. Periodic replacement of boards or panels when they rot, break, or warp. 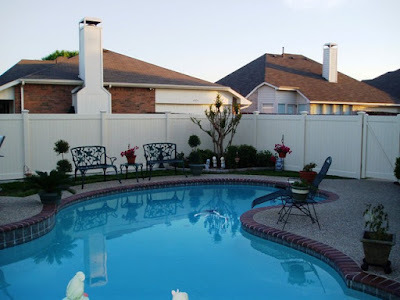 Painting or cleaning to prevent rust and corrosion from damaging the fence over time. Replacement of panels or potentially the entire fence if it breaks down or gets bent. Very occasional washing with a hose or power washer to remove dirt or grime. As you can see, vinyl fence requires far less maintenance and upkeep than fences made of other materials. That means you’ll spend less money over time and perform less work to keep your fence looking brand new and beautiful. One of the most common misconceptions about vinyl fence is that it all looks the same. In the past this was somewhat true – most vinyl fence came in only a few colors, and there was very little you could do in terms of customization. Today, however, the situation is very different. With modern vinyl fences you can choose from more than 30 colors and styles, including vinyl that simulates the look and feel of real wood but without the need to paint or stain to keep the fence looking good. We can also build vinyl fence in a variety of styles, including privacy, semi-privacy, picket, and ranch rail fence. Plus, since we fabricate our own vinyl, we can customize your fence to your exact specifications including height, base material, color and style. Ready to Buy A Vinyl Fence? If you think a vinyl fence would be right for your home, contact Future Outdoors® today. We’re the number one supplier of vinyl fence, vinyl shade structures, and vinyl decking in the Dallas-Fort Worth area. To learn more about our vinyl fences and other products, call us today at (972) 576-1600 or visit our Facebook or Twitter pages to get more tips and information.